Friendly, Family-Run Inn in the Heart of Shibu Onsen. Located in Shibu Onsen, Senshinkan Matsuya is a small (11-room) family run inn. Matsuya is located on Shibu Onsen's iconic cobble-stoned main lane. 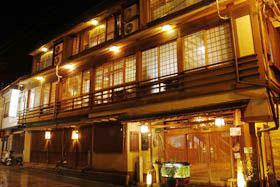 It is one of the many multi-storied wooden inns that give Shibu Onsen it's classic atmosphere. The cozy lobby and the warm greeting by the Kodama family will make you feel at home. Convenient to Jigokudani Wild Monkey Park. Staff speaks limited English but are accustomed to providing an enjoyable experience for non-Japanese speaking guests. Free pick-up at Yudanaka Station offered 14:30-17:30. Free drop-off 08:00-10:30. Free shuttle service to the Jigokudani Snow Monkey Park trailhead every morning at 09:00. From Yudanaka Station(Nagano Dentetsu Nagano Line), take local bus to Shibu Onsen (7 min), 1 min from "Shibuwagobashi" stop. From Shinshu-Nakano IC, proceed straight on to Route 29. Go through tunnel (100 yen toll) and continue straight as road changes to Route 292. At 11.4km, exit for Route 342 and take down across the river, then turn right to enter Shibu Onsen.